The Parish Council considers Planning Applications at the start of each meeting. Copies of the Plans are available and details are projected onto a screen so that everyone in the room can see them. Agendas for meetings are posted on this website under Parish Council Agendas, and on the Village Notice Boards. The Chairman will usually invite the applicant to speak in support of an application if he is there and will invite public comment before seeking the views of the Council. 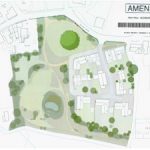 The Parish Council then sends its comments to East Devon District Council as this body makes the final decision. Special arrangements are usually put in place to deal with major or unusual applications. These will be advertised on the Notice Boards.